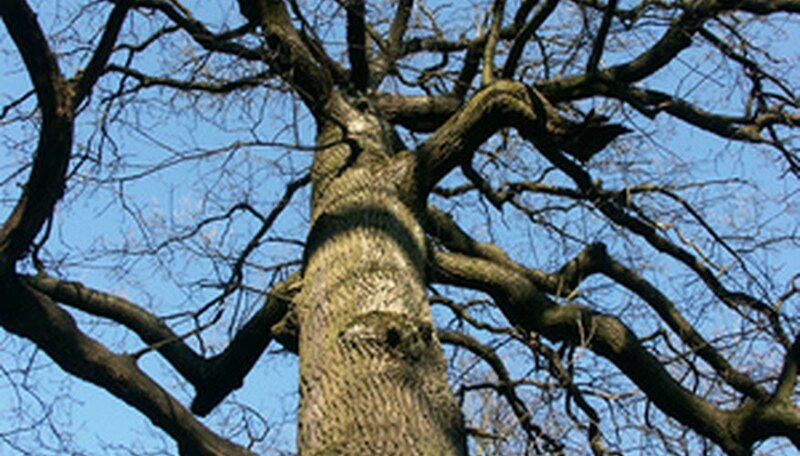 Oak trees are one of the most widely distributed of all tree varieties on earth. As a large tree, they are often a preferred choice for the purpose of shade and decoration. In the winter, oak tree care includes making sure younger trees are protected from the wind, and also making sure you have chosen a variety capable of withstanding the type of winter in your area. Some species of oak may be better able to withstand frigid temperatures than others. For example, English oaks, willow oaks and sawtooth oaks have sustained damage, especially to the tops of trees, when exposed to prolonged temperatures of minus 20 degrees F.
In most cases, there is nothing you need to do to get an oak tree ready for the winter. However, it is always good, before winter comes, to rake up all the leaves. Leaf drop occurs because the oak tree must conserve water during the winter because of reduced humidity and moisture in the soil. Removing the leaves before winter helps because fungal infections that remain on the leaves all winter could infect the tree in the spring. Remember that, depending on your location, the oak tree you have may not drop all its leaves before winter. This is true especially in warmer locations at lower latitudes. There the mild temperatures and relatively long days may encourage the tree not to drop its leaves. In some cases, the leaves may drop right at the beginning of winter, when the days are at their shortest. For most zones, leaf drop happens well prior to this point. One of the best times to plant the trees is in the late fall or, depending on your location, possibly the early winter. This helps the tree get a head start in developing its root system during the dormant period of winter. Oak trees should be planted well in advance of hard freezes because the winter weather could freeze the ground and stunt the progress of root growth. Though it may not feel very comfortable doing so depending on your location, one of the best times to prune an oak tree is in the winter. This is because the injury caused by the pruning cannot be attacked by pests, which have yet to show up. Thus, the tree has time to heal before the arrival of pests later in the spring or summer. Pruning should be done in a way that leaves the young tree with a central leader system. More mature trees only need to be pruned if branches die or become dangerous--by growing near power lines, for example. When to Trim Oak Trees?